Your English has slipped to the point that you can’t remember if phrases like “have a rest,” “I will contact with her,” and “welcome to my home tomorrow” are correct or not. Even if you can’t speak Chinese, your English is sprinkled with words like mafan and lihai and laoban. You’ve seen a movie on DVD before it’s out in theaters here. You’ve seen a movie in theaters here before it’s out in the U.S.
You’ve been in some kind of ad, possibly without your knowledge. You’ve been on Chinese TV far more times than you will ever be on American TV. As soon as you discover something new at the import store, you Wechat all your expat friends to alert them. Even if you’re only mildly attractive back home, you’re starting to develop a bit of an ego after being told over and over how beautiful/handsome you are. Even if you’re only of average height and weight in the States, you feel like a giant here, and you get really happy when you find clothes that actually fit. You’ve used Taobao to buy powdered sugar, deodorant, and mustard. You’ve used Taobao to buy much more than that. Much, much more. Way more than you care to admit. You get asked to teach English an average of once a week, more often right before the gao kao. You are frequently photographed by random strangers in public, especially at tourist destinations. You always know what time it is in your home state. Your VPN = your lifeline. You really miss driving your own car. You really, really miss cheese. You’ve requested taco seasoning packets, candy corn, and Cadbury crème eggs in care packages. You’ve attempted to make s’mores out of fruity marshmallows and digestive biscuits, and you rejoiced when China got Hershey’s so you didn’t have to use Dove. You now realize which items on the Pei Wei, Panda Express, and P.F. Chang’s menus were altered to suit American palates. You’ve been invited to some kind of banquet or meeting or party or wedding, only to suspect you are the token foreigner, there to give someone face. You’ve been invited to perform in a play, concert, or other event, only to suspect you are the token foreigner, there to give someone face. You’ve shown up for some small, casual event in shorts and a T-shirt and flip flops, only to discover it’s a major event and you are embarrassingly underdressed. You’ve stopped saying “xie xie” for everything, stopped hugging people, stopped saying “bless you” when someone sneezes, stopped trying to shake hands with or find out the names of people you meet, and stopped assuming that only the people you invited will show up. You’ve stopped expecting toilet paper in bathrooms, napkins at restaurants, or ice in drinks. You know it’s red bean, not chocolate; taro, not blueberry. You’ve taken at least a dozen photos of ads, signs, or people’s clothes with English swear words on them. But you’ve stopped taking photos of squatties, overloaded scooters, and license plates with “666” on them. You fear that when you get back to the U.S., you will throw out your back from sleeping on such soft mattresses. You fear that when you get back to the U.S., you will think chocolate chip cookies and brownies are too sweet. You are used to telling random strangers how much you make, how old you are, and how much you pay for rent. Whether or not you follow the NBA, you can recognize the Chinese name of most teams, and you most certainly know the Houston Rockets. You’ve learned the Chinese name of some new American singer or actor before you knew their English name. You don’t flinch when your taxi drives into oncoming traffic. You don’t flinch when you drive your scooter into oncoming traffic. When choosing a phone number, you get the one with more 4s to save money, but always wonder if people are laughing behind your back. Same with apartments on the 4th floor. In an instant, you can tell if the “HAH-LOW!” is friendly, drunk, obnoxious, sweet, shy, or from someone you actually know, and can then respond accordingly. Your first taxi and train rides (and your 2nd, 3rd, 4th, 5th…) were in China. You have stayed up ’til the wee hours to gather with friends to watch the Superbowl and/or the Oscars. You have gone to great lengths to eat REAL pizza. You have gone to even greater lengths to procure a REAL turkey for Thanksgiving. Every once in a while, you drop trash on the ground when there’s no trash can to be found, and you can almost do it without feeling guilty. You’ve been scolded by grannies and teachers for not wearing warm enough clothes when it’s in 20C outside. You didn’t have to convert that to Fahrenheit to understand it. …and anyone who has ever fallen in love with another country. 50 signs, culture, expats, U.S.
Neat. Thanks for sharing. You guys are really having some fantastic experiences! Thanks, Marlene. Yes, China certainly does give one lots of stories to share! This list was very good. I especially liked, You know it’s “six,” not “hang ten”; “ten,” not “die, vampire, die!” Thanks for posting. I was so freaked out the first time I asked the price of something and this old woman made an X at me. I thought I had offended her and tried to leave the shop. China…. Oh, the produce and tofu! I really miss the fruit, greens, and tofu when I’m in the States. have experienced many of these of similar with twist, like having grey hair and being helped all the time. Good grief! But sometimes it was to my advantage. Maybe not US specific but certainly foreigner. This was perfection. Thank you! I can relate to so many of these even though we are a good bit south of China. Taro and Red Bean, rock star status, no toilet paper…to name a few. Great post! great post. I laughed so hard! Perfect! I could relate to all but one of these! It’s somehow both surprising and unsurprising that other people have so many similar China experiences. Laughed my way through this list because I think I can relate to EVERY one of them!! I thought 50 was going to feel like a lot but there’s still more that can be said. Oh, wow, that is a great one. Yeah, that would be a mighty long bus ride. Haha, these were spot on! My wife and I have been living in Qingdao for almost five years now and the summer time is always packed with tourists amazed at the foreigners and snapping shots at us. I would add, for the bold who successfully passed their drivers license exam: you’ve learned to use the force when driving because you always seem to know just before a car cuts you off and respond in time. That or you know you are an American expat because you so desperately wanted to be independent you took the drivers test four times over. Thanks, Ben, and great job on overcoming #20! May the force be with you, and the odds be ever in your favor as you drive. I was introduced to your blog today through I think another blog that had posted your China has drained the extrovert out of me!! I am that extrovert. I have so enjoyed that article that I have spent way too much time(way more than I am willing to admit)to read others. All of them are so spot on! We moved here 7 1/2 years ago and sometimes it is so hard to explain to our American friends and family about life overseas. I will def be sharing your posts to give them highlights. Thanks! Hey, Veronica, and welcome to the Drained Extrovert Club! 😉 I’m happy if my posts can help a little in trying to explain what it’s like here, and give your loved ones a glimpse into China life. Thank you for stopping by! This is right on. Love it! I’m British and I can relate to most of them. 4 years and counting. That is hilarious, Trina! Who would have guessed your husband would be the star of the wedding? 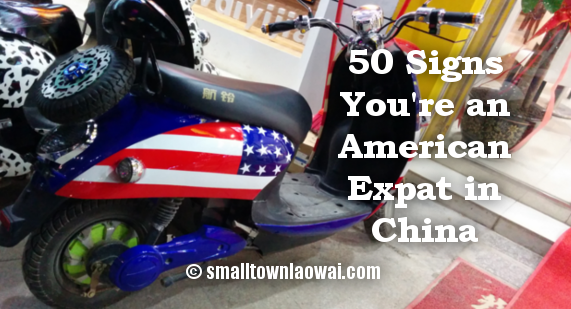 50 signs you're an American expat in China - Are You An Expat Wife?